Sometime after last night's Republican debate for the presidential nomination, Jeb Bush and John Kasich joined the mobile video app Vine. It's popular with young voters—and other candidates like Ben Carson, Ted Cruz and Rand Paul are on it—so why not? But GOP front runner Donald Trump is taking a much different approach, ignoring a considerable audience that he built up in 2013. 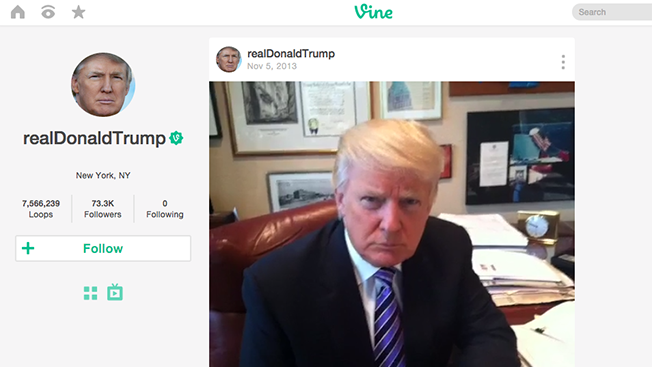 The former Celebrity Apprentice star was killing it on Vine compared to his competitors—including Democrats Hillary Clinton and Bernie Sanders—back then, with 73,000 followers and 7.5 million "loops" (which is how the platform measures views). It's surprising to see the social-media savvy Trump—who gets more social engagement on Twitter than any other candidate from either political party—missing in action on the platform. While he's likely far too busy running from one speaking event to anther while vying for the nomination to notice such an omission, it seems that his marketing team is, in Donaldspeak, missing a h-u-u-u-u-ge opportunity to engage young voters. An email to his public relations staff wasn't immediately returned. Check out the Trumpster's often-serious-but-sometimes-oddball older work on Vine below. In one take, he disses Obamacare. In another, he recommends that viewers not vote to for "perverts in New York," seemingly taking a swing at Anthony Weiner, who ran for mayor in 2013. And in yet another, he offers advice to pop star Miley Cyrus.